Oncidium orchids are known as dancing lady or dancing doll orchids for their distinctive floral design. They have so many fluttering blooms on each spike that they’ve been said to resemble branches covered in butterflies waving in the breeze. Oncidium dancing ladies developed in the rainforest, growing on tree branches in the air instead of in the soil. As with many other orchid varieties, Oncidium orchid care depends on keeping the plants in loose, well-drained rooting medium and imitating the environment in which it first developed. 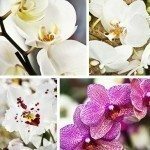 What is an Oncidium orchid? It’s a species that has developed without the benefit of soil (epiphytic) and which grows long spikes covered in colorful flowers. Start growing Oncidium orchids by choosing the right rooting mix. 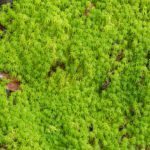 An all-purpose orchid medium with small amounts of sphagnum moss and perlite and mixed with chopped pine or fir bark gives the right amount of drainage and aeration to the orchid’s roots. Oncidium grows rather quickly, and may need to be repotted every other year. Growing Oncidium orchids includes finding a bright spot to put the planters. These light-loving plants need from one to several hours of sunlight each day. Feel the leaves of your plant to determine its light needs—plants with thicker, fleshier leaves need more sunlight, and those with thinner leaves can get by with less. One thing you learn when finding out how to care for Oncidium orchids is that they are rather particular when it comes to temperature. They like it very warm during the day, around 80 to 85 F. (27-29 C.) on average. Heat spikes of up to 100 F. (38 C.) won’t hurt these plants if they cool off afterward. At night, however, Oncidium likes the air around it a bit cooler, around 60 to 65 F. (18 C.). 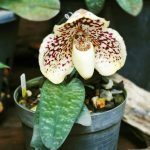 Having such a wide range of temperatures can be a tricky proposition for most houseplant growers, but is easily obtained in the average small greenhouse.